71 Mach I clone. but when the prior owner replaced the unibody he failed to maintain VIN integrity. The good news about that is I got to build it the way I wanted. It's got plenty of go and is still an almost daily driver. •	ARIZONA rust and collision free body. •	Front and rear Spoilers. •	Paint shows well but is not “show” quality. This Ford 351W engine by Tuff Dawg Engines has 426hp @ 5500rpm and 407ft lbs of torque @ 4000rpm. •	New Edelbrock Air Gap dual plane aluminum intake manifold. •	New HOLLEY STREET AVENGER 770CFM carburetor. •	New HOLLEY high volume fuel pump. •	New High Flow water pump. •	New Mallory HEI distributor. •	New K & N Air filter. •	New "SI" internal regulator alternator. •	New Headman Shorty headers. •	New Late model power steering pump. •	New Late model AC compressor. FORD High Performance Automatic Over-Drive (AOD) transmission. •	NEW 3.98 ratio 9 inch Trac Loc by Bill Thomas. •	New front discs, cylinders, hoses and simi-metalic pads. •	New rear cylinders, hardware and shoes. •	Racing front buckets re-upholstered to match original. •	NEW KYB gas adjust shocks. Sound like a great build you put together! Did the Grab-A-Track 620lbs coil pprings and 4.5 leaf springs lower the car any? Are the rear springs standard, mid-eye, or reverse eye? Lastly, can you post a side shot showing how the car looks with that suspension setup & how close it is to the ground/tire to fender clearance? Leafs are standard which brought the back up a bit. I went with standard because I wanted to make sure I had enough clearance for 2.5" exhaust pipes. Springs lowered the front a good inch. It now has a slight rake to the front. Mid eye would probably have made it about even. 71MUSTY;14607 Wrote: Leafs are standard which brought the back up a bit. I went with standard because I wanted to make sure I had enough clearance for 2.5" exhaust pipes. Springs lowered the front a good inch. It now has a slight rake to the front. Mid eye would probably have made it about even. I picked up a new third member from Bill Thomas (spent a good part of the day talking with him, What a kick) today, replacing the 4.11's with 3.89's. Once that is installed next week I plan to burn these tires off pretty quickly. Then I can replace then with something a little taller. I like it! Nice stance no saggy assend... the hockey stick looks level. It's got a good stance. Nice car too. Thanks for the pic. 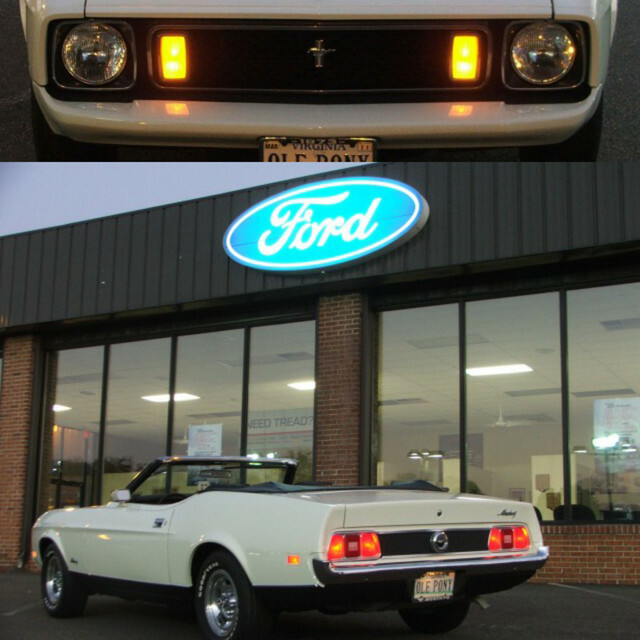 Very nice Mach 1 clone. Impressive list on the power train!